For those with young school-aged children looking to move to or within London Ontario, schools are a critical factor in the decision-making process. You want to make sure schools are convenient, offer desired extracurricular services and a superior educational experience. The Fraser Institute is a non-profit that has developed a school ranking website to help parents in determining how a school compares academically to other schools in the area. The ranking system used also shows if the school is improving, declining or remaining steady over the most recent five year period. Based on these rankings, here are the top-rated elementary schools in London Ontario. This Catholic elementary school is located at 1090 Guildwood Blvd. in London Ontario and tops the Fraser Institute rankings for elementary schools in London with an 8.9 FI rating out of a possible 10. St. Paul Separate School has steadily increased its FI rating, scoring a 7.0 in 2013, a 7.1 in 2014 and a 7.2 in 2016. 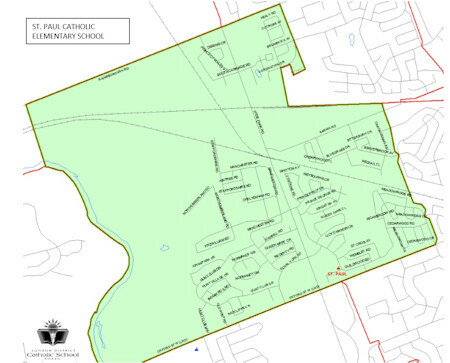 The top-ranked public elementary school in London Ontario is located at 1650 Hastings Drive in London. Jack Chambers Public School garnered an 8.8 out of 10 FI rating, improving on last year's 8.4 rating. Named after the famous London Painter, the school was constructed in 1992 and is a first-class educational facility with two gymnasiums. The staff here prides itself on offering a balanced education in the arts, academics, and athletics. 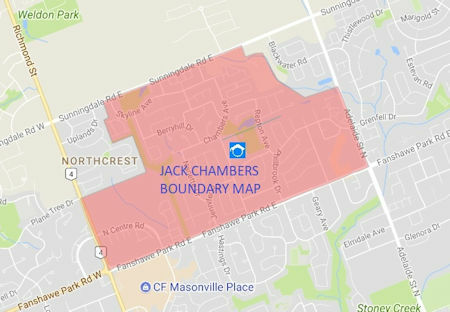 Jack Chambers Public School is part of the Thames Valley DSB. With an FI rating of 8.1, this Thames Valley DSB elementary school ranks third on the list of toprated elementary schools in London Ontario. 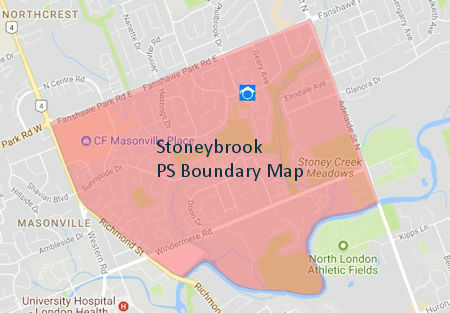 The school is located at 1460 Stoneybrook Crescent, between Richmond Street and Adelaide Street, south of Fanshawe Park Road. The school first opened in 1970. Located at 25 Hillview Blvd., Masonville serves the North End of London Ontario. 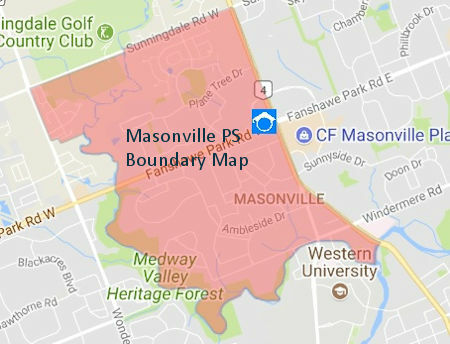 Masonville scored an FI rating of 7.9 in 2017, down slightly from 2016's 8.3 rating. The school operates with the philosophy that “Learning lasts a lifetime" and the staff believes learning occurs through opportunity, engagement, and hard work. The building is comprised of 10 classrooms, 4 Kindergarten rooms, a Learning Commons (library), gymnasium, and an activity room and a music room. Part of the Thames Valley DSB, University Heights is located at 27 Ford Crescent in London Ontario. The school scored a 7.7 FI rating, up significantly from the 6.9 rating it achieved in 2016. Due to the school's proximity to The University of Western Ontario, many who attend here have families affiliated with the university. The school is noted for its wide variety of programs that provide a well-rounded education along with its excellent music, dance, and drama programs. The multicultural environment in the school is a source of pride. With a 7.6 FI rating, Byron Somerset ranks sixth as one of the top elementary schools in London Ontario. The school, located at 175 Whisperwood Avenue in London, serves 185 families in Southwest London. School initiatives focus on exemplary programs, safety, and communication. The school offers a bright, clean atmosphere that serves not only the educational needs of the neighborhood but also hosts community-based programs throughout the school year. One of the best elementary schools in London Ontario with a 7.6 FI rating is the Clara Brenton school at 1025 St. Croix Avenue. Since original construction of the school in 1963, there have been three renovations and construction projects, the latest which was completed for the 2007-2008 school year. The community supports the school through a variety of organizations including the School Council, the Healthy Schools Committee, the Safe Schools Committee, and the Home and School Association. At 555 Sanatorium Road in London, John Dearness school scored a 7.6 FI Rating making it one of the top-rated elementary schools in London Ontario. The school has been serving the area for over 40 years and currently enrolls about 250 students. Building character, recognizing success and achievements, and parental involvement are cornerstones of education at John Dearness. The London Ontario area provides a number of exceptional schools. If you are considering a move to or within the community, contact us for assistance in making the choice best for your family.